• Mobile app lets you support customers anywhere, anytime! EXCLUSIVE OFFER: REGISTER HERE TO GET YOUR CHATBOT DESIGNED AND DEPLOYED FOR YOU FREE WHEN YOU SUBSCRIBE TO TRUCHAT*. 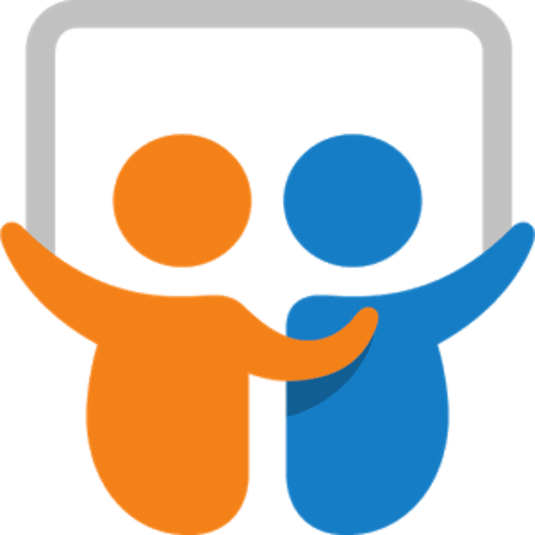 TRUCHAT SCREENCASTS AND TUTORIALS ARE AVAILABLE ON OUR YOUTUBE CHANNEL. FOR LIVE WEBINARS, DEMOS, WHITE PAPERS, AVAILABILITY AND OTHER ANNOUNCEMENTS, OR TO JOIN THE TRUCHAT BETA PROGRAM, REGISTER TODAY. YOU'LL STAY UPDATED ON THE LATEST INFORMATION ABOUT TRUCHAT. Thanks! You'll now be updated on TruChat as we approach product launch. *By registering above, you'll receive a promo code before TruChat is released that gives you FREE setup and configuration when you subscribe to any TruCHAT package. Easy to install, customize and configure live chat widget. Configure as pop-up or build right into the web page. Fully customizable to match your brand and style. Select purpose-built chatbots from the TruCHAT library to start collecting leads, servicing users, & more...fast! TruCHAT combines scripted flows with AI to allow your bot to respond to unscripted inputs such as questions. 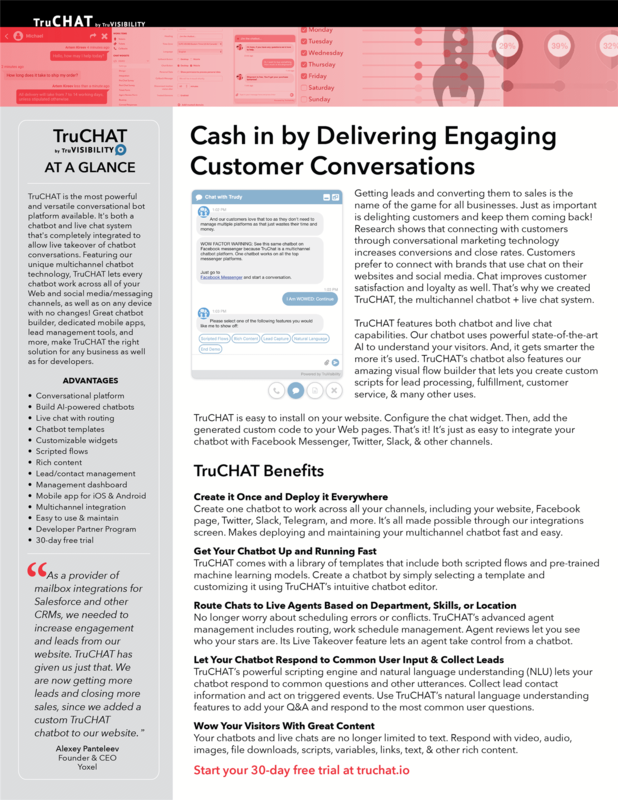 Program your FAQ right into TruCHAT and increase customer engagement. Create a chatbot and deploy it on your Website, Facebook Messenger, Twitter, and other channels. Include rich content in your chatbot scripts & intents, including: videos, images, audio, file downloads, links, variables, math, API & more! Native apps for iOS & Android. Live agents can take over from a TruCHAT chatbot session at any time during the conversation. View chat history, callbacks, tickets, and more. Your TruCHAT chatbot is not limited to just text. Respond with video, audio, images, files, scripts, variables, links, text, & other rich content. Generate support tickets from chats. Pre-order by completing the form below and get your first 6 months FREE!